With all the years that I have both coached and run leagues and club teams, I have seen this situation come up so, so, so often. Sometimes it is the coach who is missing it and isn’t fair or holds a grudge or has a personal agenda. I do get that and see that from time to time. 1. Maybe your child isn’t really putting out the effort at practice. If he isn’t working hard and giving 100%, he does create a dynamic that is negative and not conducive for a fun, energetic and motivated atmosphere. 2. Maybe your child is an “under the breath” complainer and his body language speaks volumes about his unhappiness. 3. Maybe your child is not coachable. This kind of attitude can be a “team killer”, and then he still thinks that he has the same privileges as the others to lots of playing time. 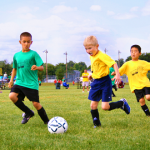 Kids need to learn that playing time comes from skill level combined with a coachable spirit. 4. Maybe he isn’t really getting along with the other kids and when he’s out there on the field or court, he actually creates an ugly and destructive atmosphere. 5. Maybe your child isn’t working that hard and not showing signs of improvement. The other kids are following the instructions and really trying to advance their skill level. Kids who don’t work hard really set a stage that is restrictive to a practice of intense work and desire to get better. 6. Maybe your child doesn’t really want to be there. This does happen quite often. Kids who don’t want to be there let everyone know that by the way the talk and by their body language and practice efforts. 7. Maybe your child just doesn’t care anymore and doesn’t have any desire or motivation anymore. This is displayed in laziness and lack of effort. This is really frustrating for a coach who is trying to put together a team of good positive energy and an atmosphere of fun and cohesiveness while building a good and solid team. 8. Maybe your child doesn’t listen. He is so tired of being there that he talks with the other players when the coach is talking, or disrupting the instruction by making silly sounds or by drawing the attention to himself. 9. 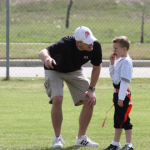 Maybe your child is defiant to the coach’s authority. This is played out many ways. Sometimes it can be verbal, sometimes by not responding positively to coaching instruction, sometimes by an attitude of passive indifference. 10. Maybe your child isn’t that good. Wow, ok, there you have it. Maybe he isn’t as good as the other kids and it is very difficult for a parent to see that. The best way to see things objectively is to be humble enough to ask someone that will be honest, with an unbiased opinion to help you see things clearly. The benefit of seeing the truth and seeing what is really going on is so important for the future growth and character of your child as well as the other kids. Finding out and submitting to the truth isn’t always easy but can be so powerful as you lead and guide your children along that journey of correct responses and the right way to treat people.